Thanks for sharing this, looks great! Any questions or suggestions for new features post them here. I have another version coming out soon which will show your running total on each day not just at the top. That way you can copy and paste a bunch of "y" into the future and see what day you hit 84 etc. In the spreadsheet if you click on the column headings ("AMEX", "USAA", etc) they are live weblinks and will take you to the CMS website. July C* is now behind us time to set the EQ Tally Month# to 7 in the spreadsheet and get moving before Aug C*! thanks I figured you would like it! I really dont understand how B or (bumping) of inquiries work I dont know where to begin so maybe i can get help from alot of experts here. 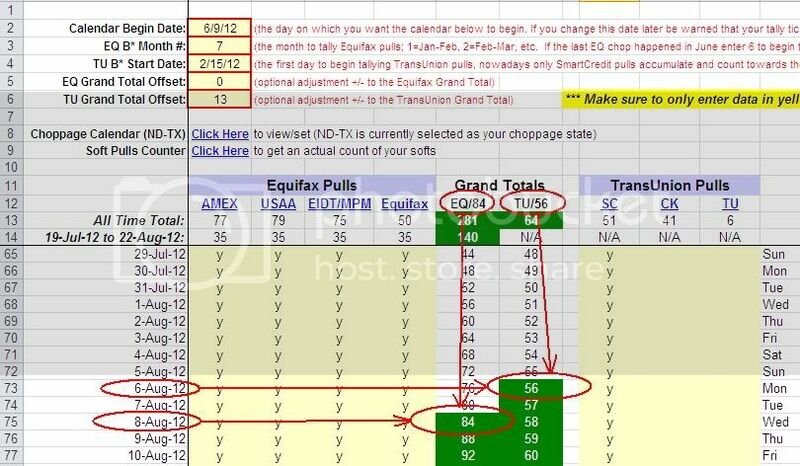 Equifax-Transunion_Experian and i dont see anything getting bump off what Im I doing wrong? Since last month I added a couple more this is what i got now. as you can see there is alot of pulls going on this * thing is pulling my leg? Can the expert give me advice on what time i should i pull everyday? Or how do I know when I get C choppage? Don't GUESS if you'll make it time...KNOW! Just type in "Y"'s into the future and know when you'll achieve your B* goals! need experts advise on how to pull the right way. make sure to download today's version and try again. make sure you entered your "y"'s into the spreadsheet accurately. If that doesn't help let me know. Just wanted to say thanks for your awesome spreadsheet! I discovered this forum a week or so ago, and I think I've now got a decent idea of what B* entails. Going to give it a shot, so wish me luck. 3 pulls a day keeps "The Man" away! you have to change the B* Month# at the top to 7 (July). Its no longer June. also make sure your calendar BEGIN date is before the last chop period. Make it July 13th or earlier. 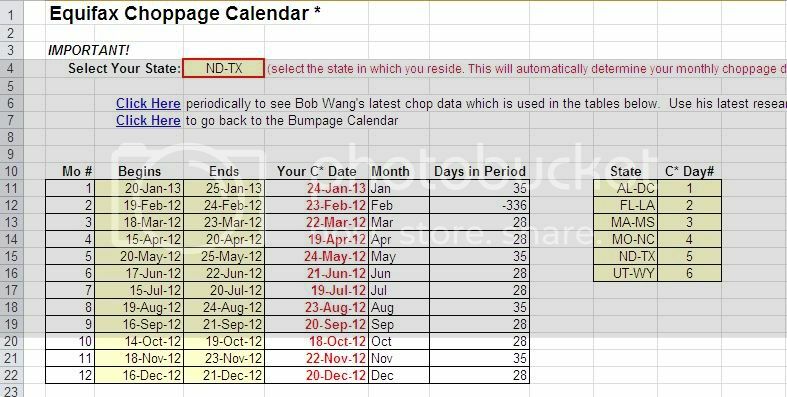 I will fix spreadsheet so users can't select a date after the last chop date. Remember that all the BLUE UNDERLINED text items in the spreadsheet are hyperlinks to awesome related resources on the web. Click on them! This is your command center for sticking it to the man! Unfortunately, Equifax did not return any data when we submitted the information you entered on your order form. 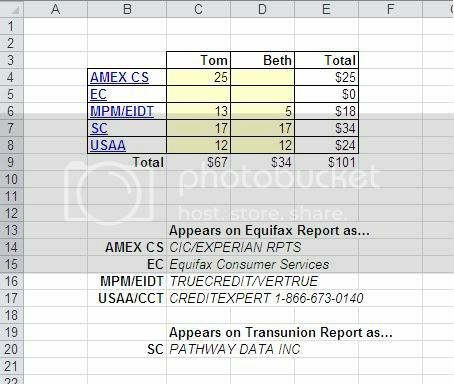 This may be because they have no credit record for you (for example, if you have had no previous credit relationships or have recently moved to the United States from abroad) or the information you supplied did not match the information in their database. the spreadsheet tells you what services work on EQ. With column title links to the services websites! You need at least three pulls per day to git r done in time (4 weeks). Four pulls/day gets u done in three weeks. CK and TU are useless. Just left them on the spreadsheet for fun.